Phew! Finally I can blog about what Owen and I did this weekend. I’ve been keeping it a secret because it was a surprise for my Mom’s birthday. Since my Mom reads the blog, I didn’t want to give it away, hence the lack of posts from me last week. Owen and I flew to Philly this weekend, just the two of us! It was his first time in the air, and my first time being a “single” mom for an out-of-state trip. Bottom line: It was a lot easier than I expected! The trickiest part was packing our bags carefully so I had all of the right items at the right time. I was very nervous that he would fuss while we were in the air (which feels worse than fussing on the ground to me because other people can’t get away! ), or that it would be horrible getting through security with all of his stuff and my breastmilk and my pump, etc. I was planning to fly to Philly last Thursday night. In hindsight I’m not sure why I chose an evening flight (I was supposed to arrive around 7:30pm, one hour after Owen’s bedtime routine usually starts) because it was sure to mess up his nighttime sleep, but that was when my brother could pick me up at the airport. All day Thursday I packed and repacked our bags, made lists of all the things I needed to remember to bring, and planned out bottles and breastmilk (had to dip into the freezer stash to ensure that he’d have enough to eat even if I couldn’t find a place to pump in the airport). When the time came to leave for the airport I found out my flight was delayed due to crappy, rainy, foggy weather. BUMMER! At least I found that out before we left the house, though. So we waited. And every time I checked the flight, it was delayed a little longer. Finally I was so stressed about being stuck in the airport with Owen all night long that I called the airline and asked them to switch my flight to Friday morning. Thankfully they switched it without any issues. So Owen got one more night in his own cozy bed before our big trip. Friday morning I had to take a cab to the airport because Benjamin was working. 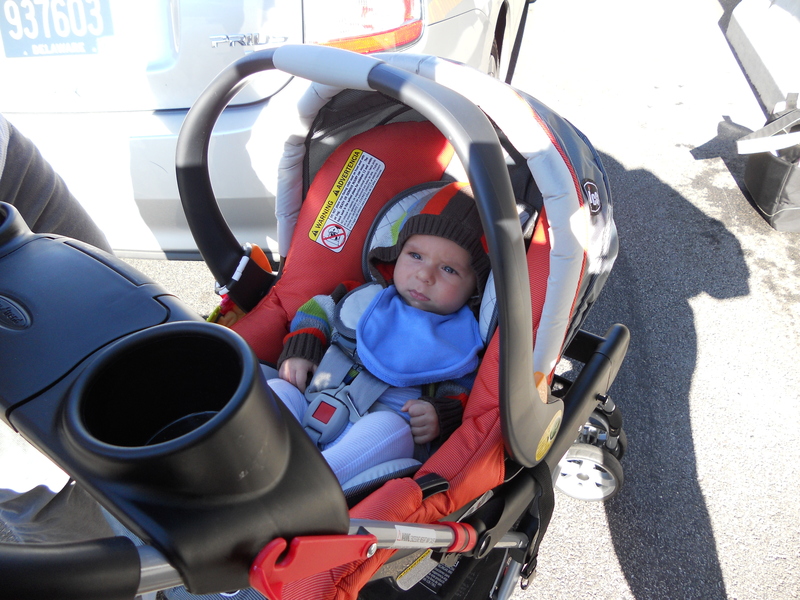 Challenge #1 — how to put the car seat in a cab without the base! Verdict: Really not that hard. Turns out the cab driver also had a three month old, and he spent the entire drive saying things like, “Does yours sleep through the night? Mine has been sleeping through the night since he was 2 weeks old.” “Do you put rice cereal in his bottle? We’ve been putting rice cereal in for 2 months now and we only have to feed him 3 times a day”. Thanks for your advice, buddy! When I got to the airport I realized that amidst all of my careful planning I had forgotten to put cash in my wallet. Yikes! 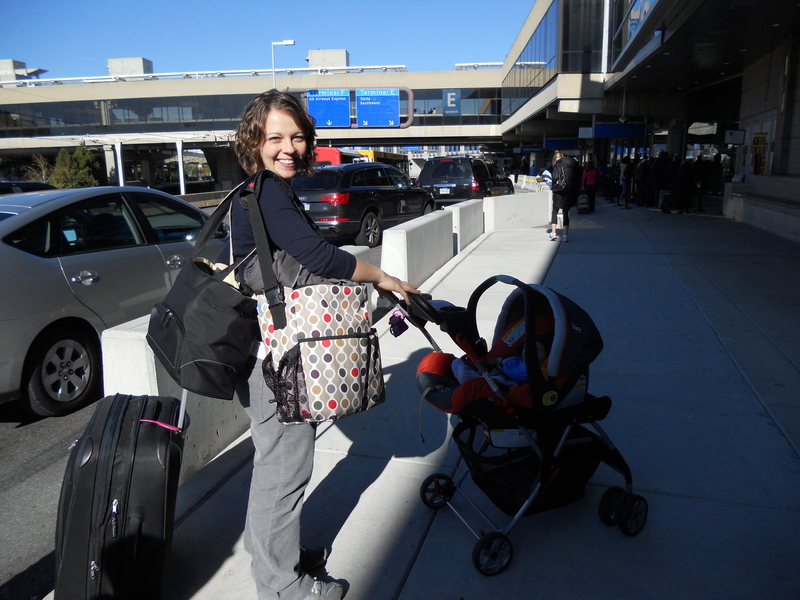 I had to grab the baby and the snap-n-go stroller and run (literally… run) into the airport to get cash while the cab driver waited with my suitcase. So I was already sweaty and agitated when I went to check my bag and check-in. High blood pressure moment #2: The check-in lady asks me for Owen’s proof of age. I knew he had to be under 2 years old to be a lapchild, but I figured there’s no denying that he’s under 2, and I didn’t have any official document stating his birthdate. We haven’t received his birth certificate from the hospital yet (ummm, perhaps I need to check on that), but thankfully I had his immunization record stuffed in my diaper bag. Without it, we wouldn’t have been able to get on the plane!!! Once we were checked in, the really scary part was looming: going through security. Turns out there was very little to worry about here as well. I had brought my Moby wrap along, so I popped Owen in the Moby, broke down the stroller and car seat, and put my diaper bag and breast pump in the x-ray machine. They didn’t bat an eyelash at my cooler bag of breastmilk or the pump (which I imagine looks kind of crazy in the x-ray machine!). Everyone ooohed and ahhhed over what a cutie he is and there was no shortage of people offering to help me with my bags. Easy peasy. It wasn’t hard to find a quiet place to feed Owen, and Southwest even had a bathroom with a little “nursery”, which was a room with a locking door, a changing table, a sink and a plug. Score! Perfect place for pumping and diaper changing before our flight. By the time we got on the plane, Owen was fed, happy and half-asleep in the Moby. There were empty seats on the plane so I was able to put his carseat next to me, although we didn’t even use it. He stayed happy on my lap the entire flight! Not a peep out of him except for some adorable cooing and laughing. Those sitting around me were extremely happy, as was I 🙂 What a good little traveler! The trip home was pretty much the same. I was a bit more comfortable with the security line, I knew what to show for his proof of age, and I even found another “companion care” bathroom I could use to pump in before our flight. The air pressure didn’t seem to bother his ears at all, although I ended up feeding him for two out of the four takeoffs and landings. The turbulence we hit even helped keep him asleep while we bumped along. The surprise for my mom was pretty awesome too. I put Owen in his carseat outside the front door and rang the doorbell. My mom answered the door and was SHOCKED to see him. There were tears of joy. I think it was a great birthday present! Our weekend away was so fun and I had a blast with my family, but I must say, I am happy to be back in my own little bed! Sleeping on an air mattress in the same room as Owen does not make for restful sleep. So today we’re laying low. Doing laundry, getting as many naps in the crib as possible and maybe venturing out to the grocery store. A happy Monday!